Zion is fortunate to have a tradition of faith that has been the keystone to our long survival. 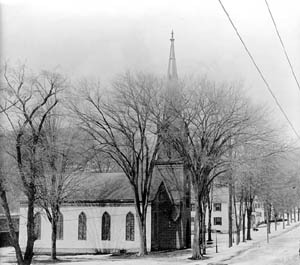 Our official history records declare that the first Zion Congregation was chartered in the year 1760. Prior unofficial records, specifically notes from Henry Melchoir Muhlenberg’s travels, would indicate that the first Lutheran Church service was held in German Valley (now Long Valley) in Fossberg Chapel located on Fox Hill in 1745. The assumption is that some of our founding members were in attendance at those earlier sporadic Lutheran services. Since the records have not been substantiated to date, Zion has declared that 1760 will be the official congregation’s genesis. As the congregation evolved, the founding members joined ideas with the German Reformed Church membership in the area and erected a shared church building in German Valley in 1774. The remains of this building can still be seen on Fairview Avenue, Long Valley. Significant church structural events in our history are the erection of the current church building in 1832, the erection of the bell tower in 1861, Field’s Hall addition in 1938, and the Education Hall addition in 1967. As members grew in their faith, the need for additional facilities to share their faith also grew. Our congregation family, steeped in tradition, is a diverse collection of people supporting our community with human ability and human will. Our membership is proud to be a part of such a great community and to be a part of the great heritage our church offers. Written by Ray Walborn for our 235th Anniversary in 1995.